Posted by Capital Living in Art & Entertainment, Events Calendar, Family Activities, History, Tourism, What To Do In Frankfort This Weekend?, What's Happening This Weekend In Frankfort? 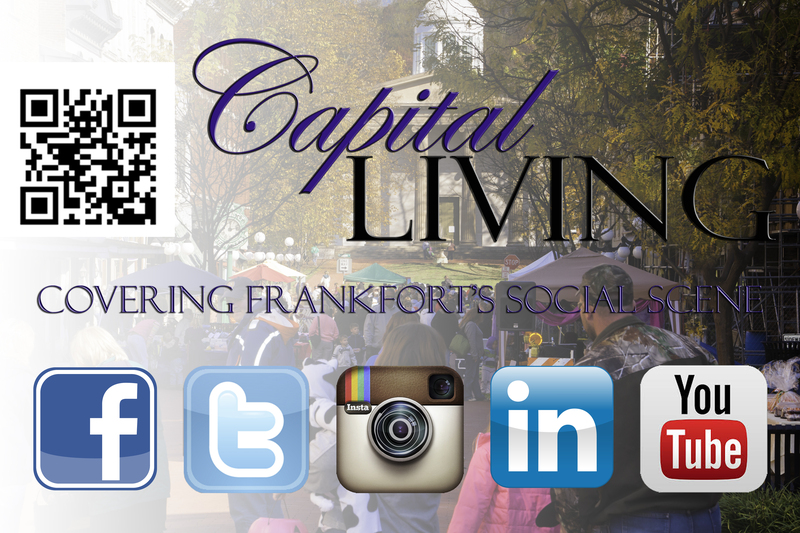 Capital Living, What to Do, What to Do In Frankfort, What To Do This Weekend, What To Do This Weekend in Frankfort? 6:00 pm – Community Forum for FIS Forum, at the Paul Sawyier Public Library, 319 Wapping St. Frankfort Independent Board of Education will host a community forum for school district residents, The Board will provide information on a tax that the district is eligible to levy that will be matched by state government funds. The levy would be 5 cents per $100 of property value and would be restricted to the improvement of school buildings. Play with light, explore the outdoors, and learn photography techniques to capture nature’s wonders. Each workshop will explore an aspect of nature photography and allow time to practice on the JSP grounds. Assignments between workshops and thoughtful critiques will push your skills to the next level. Finally, you’ll select your best work to be printed for a group show at the Fall Arts Festival! For ages 11-17, beginner and intermediate level. No photography experience is required, just an interest and a curiosity to explore. This Photo Club workshop is FREE, but registration for each meeting is required. The Photo Club will meet every Wednesday from July 27 – August 31, 6:00-8:00 pm (6 classes). Attendance to at least 4 classes is required for inclusion in the JSP Fall Arts Festival Exhibit (Sep. 11). Participants may use their own digital camera or reserve one. A digital SLR, point-and-shoot or other device that allows adjustment of exposure settings is required. Contact Karen at klanierphoto@gmail.com to reserve a Canon Powershot A800 digital point-and-shoot. Printing will be an additional expense, estimated at $10-$30 per high-quality, mounted, enlargement. Karen Lanier is a naturalist, photographer, author, and environmental educator who earned a unique degree in Environmental Documentation, the fusion of conservation studies and documentary storytelling. She has led youth photography classes and workshops since 2011, and prefers to see the world through a child’s eye. This workshop is sponsored by the Kentucky Foundation For Women. Pint Night* serving Dalton’s Juice Barrel Aged Kettle Sour. When you buy the featured pint, you get to keep the brewer’s pint glass *limited supplies at Bourbon on Main, 103 W Main St. Info: 352-2720. Join us at Poppy’s Bakery on September 1st starting at 6:30am for FREE samples of our delicious baked goods. Cakes, cookies, pastries all kinds of tempting treats. FREE Samples, Poppy’s Bakery, 875 Wilkinson Blvd. 875-5535. Join us at Liberty Hall for our next After Hours at Liberty event to unveil our new historic laundry room setting. In addition to touring the room setting, event-goers will enjoy music by the Leestown Jug Band, featuring John Harrod, and a specialty potato chip-and-dip bar. Beer, wine, and soft drinks will be available for purchase. Admission is free. Rain date: Sept. 2. 6:00 pm – Auditions for Frankfort Children Singers, at First Baptist Church, 201 St. Clair St., Auditions also 10:00 a.m. Saturday, September 3, For 2nd through 8th grade boys and girls. No preparation required. Info: 227-3748. Equus Run Vineyards is serving up a rocking good time with a low country shrimp boil by local favorite cajun chefs from Bourbon N’ Toulouse. The Tweak will be getting you in that New Orleans mood with jazz. Be sure to get here early to try our specialty cocktail with Sorella Gelateria! Bring your lawn chairs and picnic blankets. Tickets are $36 includes dinner and music! Live music featuring Mike Archer, at La Fiesta Grande, 334 St. Clair St. 352-2395. Outside grill open! Live music featuring Tommy Womack (from Government Cheese), 7:00 – 9:30 pm, Phat Mattress, 10:00 pm – 12 midnight, DJ Jesse Penn, 12 midnight – close, 325 St. Clair. Info: 875-2559. Join Bert Lams, of the California Guitar Trio, and Tom Griesgraber, master of the rare chapman stick, at the Kentucky Coffeetree Cafe. “Local audiences might know Bert Lams as one-third of the acclaimed California Guitar Trio. A classically trained, Belgium-born player, he long ago mastered the fine art of genre-jumping. He showcased his classical prowess with a superlative solo album of Bach Preludes (Nascent), but Lams has stylistically leap-frogged with the CGT from classical to surf to accomplished original compositions to prog-rock covers. With the release of Unnamed Lands, guitarist Bert Lams and Chapman Stick player Tom Griesgraber celebrate the completion of one of the most inspired projects either musician has ever been a part of. Fourteen original instrumental tracks tie together with artwork and text to tell the adventures of a North American wagon train journey through one traveler’s personal experiences circa 1840. You don’t have to choose a side to ride with us! Soldiers and their families, from the Union and the Confederacy, descend upon BGRM to teach us a little more history of the life, times, and deaths, of this time of our past. This side of history will be brought to you by the Kentucky 5th Volunteer Infantry, and the 14th Kentucky Light Artillery. We’ll also host the Kentucky Historical Society HistoryMobile! It will feature the exhibit “Torn Within and Threatened Without: Kentuckians in the Civil War Era”. There will be no charge for you to walk through the HistoryMobile, as it has been generously sponsored by Graviss McDonald’s, of Versailles, Frankfort, and Lexington. Come join us for this remarkable event, here in Versailles! This event will not feature a steam engine. The train leaves the station at 2 pm, but be sure to arrive much earlier for our Civil War Camp, exhibit hall, gift shop, and model railroad layouts. Double Dog Dare brings an exciting show….covers, country, pop, everything! Double Dog Dare is a Shelbyville home town favorite! Any flavored margarita or sangria margarita $3.99, at La Fiesta Grande, 334 St. Clair St. 352-2395. Live music featuring Eddie Barber Band, and Hot Prowlers, at the Brick Alley, 325 St. Clair. Info: 875-2559. Open at 2:00 pm, Live music with Gus Moon, Wolf Cryer & Kevin Milner, 6:00 pm, at Bourbon on Main, 103 W Main St. Info: 352-2720. This series will meet 2 times: Monday night Sept. 5 from 5pm-7pm and again on Sunday Sep. 11 during the Fall Arts Festival at JSP (anytime between 11am-6pm). Fun for all skill levels, no experience needed. All materials provided as part of the class fee. Explore metal casting and create your own relief sculpture during our aluminum pour at the Fall Arts Festival. On the first class night, you will develop a design and learn carving skills to bring your design into 3 dimensions by scratching your design into a sand mold. We will be using drawing skills, imagination and inspiration from the nature and sculptures available at the park. You may also come with sketches or ideas for your design in mind, but that is not necessary. Our second class “meeting” will be during the Fall Arts Festival at JSP on Sunday, Sep. 11. You may arrive with your mold at any time during the event (11am-6pm) to get your mold poured by the crew from Sculpture Trails who run the metal casting event at JSP. You will learn from them about the pouring procedure and finishing your aluminum sculpture, which you will get to take home that day. This is not a formally scheduled “class” as you may come and go as you like, stay as long as you like, you could even create another sand mold if you want to ($30 each the day of the event). 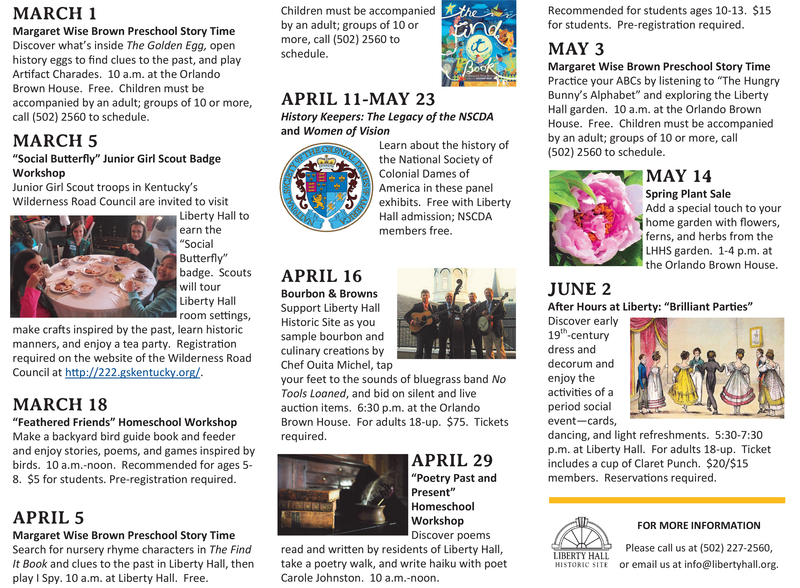 10:00 am – Margaret Wise Brown Preschool Story Time: Goodnight Moon, at Liberty Hall Historic Site, 202 Wilkinson. FREE event. Children must be accompanied by an adult, groups of 10 or more, call 227-2560 to schedule. 227-2560. Meet at Cove springs park wetlands area parking lot. We will spend the afternoon exploring the wetlands, this will be a family friendly guided hike. La Fiesta Grande, 334 St. Clair St. 352-2395. Enjoy everyday lunch specials for $7.00, includes drink!